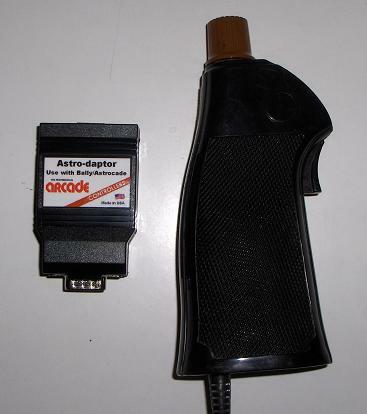 MAME is the only emulator that can emulate the Astrocade. 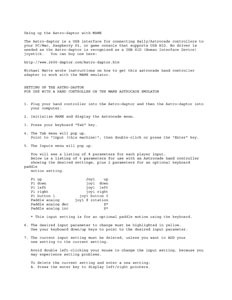 From the MAME website: "MAME (originally stood for Multiple Arcade Machine Emulator) absorbed the sister-project MESS (Multi Emulator Super System), so MAME now documents a wide variety of (mostly vintage) computers, video game consoles and calculators, in addition to the arcade video games that were its initial focus." MAME Website - This is the official MAME website. The latest version of MAME, which can emulate the Astrocade, is here. You can also download older versions of the software here. MAME supports Windows, Mac and Linux. These are MAME Astrocade keyboard labels ready to be printed onto quality paper and then applied to a keyboard. For use with AstroBASIC, Bally BASIC, Blue Ram BASIC, Vipersoft BASIC, and Expanded BASIC. Printing onto sticker-paper is suggested but that is not required (sticker-paper does make adding the labels easier though). 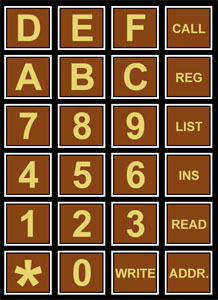 The keypad stickers may be applied to any keys after the keyboard is mapped in MAME. Mapping the keys as a 4x6 column (just like on the Bally/Astrocade keypad) works extremely well. 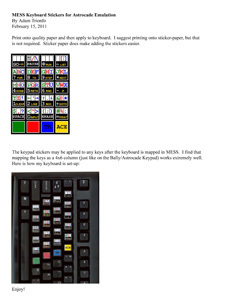 A sample picture of how a keyboard is set-up and mapped is included. Note: Make sure NOT to use Page Scaling when printing these stickers, otherwise the stickers will not be the correct size to fit on the keyboard's keys. For those with the ability to print a higher-quality version of just the labels (with no jpg artifacting! ), then the original TIFF version is available here. These are MAME Astrocade keyboard labels that are ready to be printed onto quality paper and then applied to a keyboard. This overlay is for use with the Machine Language Manager cartridge. Printing this overlay onto sticker-paper is suggested but that is not required (sticker-paper does make adding the labels easier though). 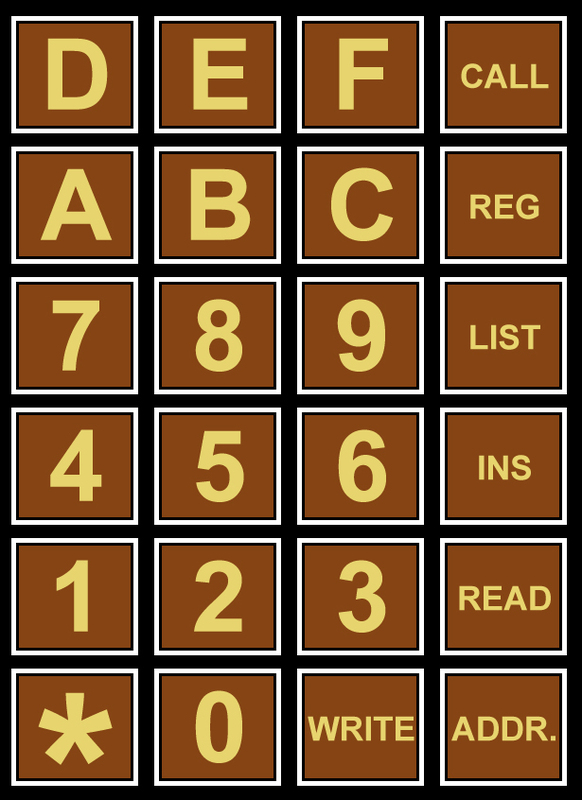 The keypad stickers may be applied to any keys after the keyboard is mapped in MAME. Mapping the keys as a 4x6 column (just like on the Bally/Astrocade keypad) works extremely well. See the sample picture of how a keyboard is set-up with the BASIC overlay. If you have the initiative and would like to change an individual button, then a sample PSD button is available here. Setting Up the Astro-daptor with MAME. These instructions explain how to use this the Astro-daptor with the Astrocade emulator included in MAME. The following MAME and MESS files are very outdated. They are being kept here for archive purposes. When possible, use the latest version of MAME from the official MAME website. An older (version .561), precompiled, version of MESSD (Multiple Emulator Super System Dubugger) for Windows. MESS Snapshots Astrocade MESS Snapshots - Optional use with MESS. MESS Titles Astrocade MESS Titles - Optional use with MESS.